The overall precast concrete market is expected to grow from USD 99.13 billion in 2016 to USD 138.96 billion by 2022, at a CAGR of 5.96% from 2017 to 2022. It has been growing in accordance with the advancing degree of urbanization, industrialization, and infrastructural developments. The gradual shift of building contractors and consumers toward cost-efficient, eco-friendly, and modern building techniques is creating growth opportunities for the precast concrete market. 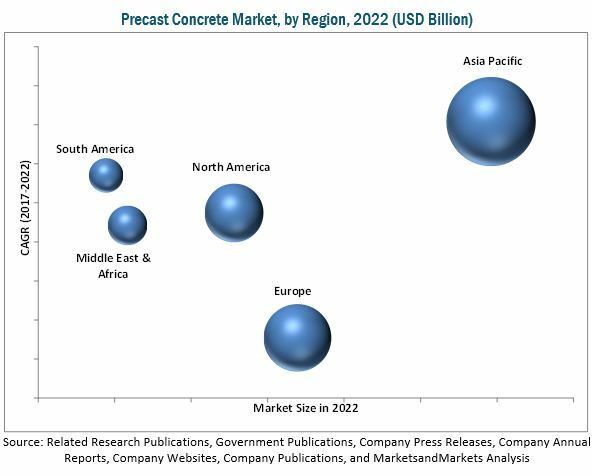 The increasing disposable income of people in the developing countries and the changing preferences of construction methods are increasing the reliance on modern construction techniques, which drive the precast concrete market growth. The precast concrete elements are used in residential and non-residential sectors. The base year considered for the study is 2016, and the forecast has been provided for the period between 2017 and 2022. Precast concrete construction offers significantly reduced construction time. Reduction in time also results in a reduction of human labor, which leads to cost saving. Precast components are produced in factories under a controlled environment, enabling easy adjustments and real-time monitoring. Unlike cast-in-situ construction, precast uses fewer resources such as cement, steel, water, energy, and human labor, thereby generating less waste in the factory and at the construction site. Precast construction allows parts of an entire building to be made even before the completion of the foundation for the same. Modular constructions take only four to eight weeks to be completed and assembled, while the conventional on-site constructed buildings require twice the time for construction of a similar-sized structure. Improved quality and productivity, shortened construction time, and reduced waste generation make this type of construction method cheaper, which makes it a preferable choice for end users. 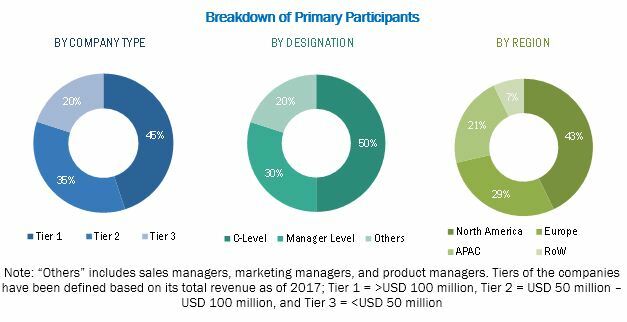 During this research study, major players operating in the precast concrete market in various regions have been identified, and their offerings, regional presence, and distribution channels have been analyzed through in-depth discussions. Top-down and bottom-up approaches have been used to determine the overall market size. Sizes of the other individual markets have been estimated using the percentage splits obtained through secondary sources such as Hoovers, Bloomberg BusinessWeek, and Factiva, along with primary respondents. The entire procedure includes the study of the annual and financial reports of the top market players and extensive interviews with industry experts such as CEOs, VPs, directors, and marketing executives for key insights (both qualitative and quantitative) pertaining to the market. The figure below shows the breakdown of the primaries on the basis of the company type, designation, and region considered during the research study. In March 2018, Bouygues Construction, through its subsidiary Bouygues Bâtiment Ile-de-France, signed a contract with Abu Dhabi Investment Authority (ADIA) to build Alto Tower at La Défense in Paris, valued at USD 221.3 million. In January 2018, The Victorian Government signed a contract with Cross Yarra Partnership, a consortium led by Lendlease (Australia), John Holland (Australia), Bouygues Construction, and Capella Capital (Australia). The consortium will be responsible for financing, designing, and building the future Metro Tunnel in Melbourne, and its maintenance for 25 years. The project is worth USD 4.79 billion. In December 2017, ACS Group, through its Dragados USA and John P. Picone, Inc. won the contract for the Long Island Rail Road (LIRR) Expansion project. The contract included designing and building a 9.8-mile third track between Floral Park and Hicksville, in Long Island, New York, valued at USD 1.73 billion. What are new application areas which the precast concrete companies are exploring? The overall precast concrete market is expected to grow from USD 104.03 billion in 2017 to USD 138.96 billion by 2022, at an estimated CAGR of 5.96%. The precast concrete market is expected to witness high growth as a result of the rising urbanization, large-scale investments in infrastructure & industrial sectors, and rising construction activities in emerging economies. Precast concrete refers to a construction product prepared by casting concrete in a reusable mold or matrix, and cured in a standard controlled environment, which is later transported to the site of construction and lifted into place. Precast concrete is widely used in precast construction. Precast construction refers to a construction process where the structural components are standardized and manufactured in a plant located away from the construction site and then transported for assembling. A significant change has been witnessed in the construction industry with the introduction of precast technology as it allows the construction of a large number of structures while ensuring reduced time and cost, compared to conventional onsite construction methods. The precast method offers the benefits of high quality, increased efficiency, and better finishing. The precast concrete market in APAC is expected to grow at the highest CAGR during the forecast period. The growth of the building & construction industry and improvements in financial conditions in the region have led to the increase in demand for precast concrete elements. The growth of the precast concrete market in these countries is driven by factors such as an increase in construction activities of residential and non-residential buildings, the rise in population, and economic development of the region. The precast concrete components are used in non-residential and residential sectors. Growth of precast concrete market is supported by the rising public and private investment in the infrastructural sector in the emerging economies of Asia Pacific, the Middle East, and South America. Precast concrete components are extensively used in non-residential sector, including usage in commercial, industrial, healthcare, hospitality, infrastructural, utility, and sports-related constructions among others. Precast construction (such as relocatable buildings) are deployed to provide help in the disaster relief to deliver emergency shelter and medical assistance. In infrastructural applications, precast concrete is used in transportation infrastructure, including highways, tunnels, bridges, and seaports. The application of precast components in this sector covers construction of new residential buildings, renovations, and restructuring. In some of the developing or under-developed countries in the Asia Pacific region as well as in Africa and South America, people are less aware of this construction method. A preconceived notion of the residential consumers that precast buildings have a shorter life or cannot sustain natural calamities is restricting the growth of the precast concrete market in the residential sector. What are the potential markets for precast concrete industry? Factors such as weak economic conditions in many European countries such as Spain, Greece, Romania, and the UK as the aftermath of the financial recession of 2007–2009 and skeptical mindset of people toward the quality of precast structures might restrict the growth of the market. The global precast concrete market is dominated by players such as Actividades de Construcción y Servicios (Spain), Bouygues Construction (France), Larsen & Toubro (India), Taisei (Japan), and Balfour Beatty (UK). Other players include Skanska (Sweden), CRH (UK), Cemex S.A.B.DE C.V. (Mexico), Laing O’Rourke (UK), and Julius Berger Nigeria (Nigeria). These players adopted various strategies such as contracts, collaborations, agreements, partnerships, and joint ventures to expand their presence in the precast concrete market. 12.1 ACS, Actividades De Construccion Y Servicios, S.A.
12.3 Cemex S.A.B. De C.V.
12.15.4 KEF Infrastructure India Pvt. Ltd.
12.15.5 Preca Solutions India Pvt. Ltd.
12.15.8 Coltman Precast Concrete Ltd.